Snappy Face Recogniser | OhGizmo! If remembering your login password is too much of a task for your brain to deal with at 9am and that post-it-note where you wrote it down is long gone then the Snappy Face Recogniser could save you yet another call to your office’s sysadmin. 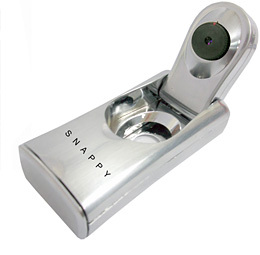 The Snappy is a small 1.3 megapixel camera that also includes advanced facial recognition technology that will record and later recognise a user’s face and can automatically log them on to their computer. The device is also small and collapsible making it easily transported along with your laptop for that extra bit of security while travelling.